Editor’s note: In the August issue of WindCheck (available online at windcheckmagazine.com), Brad wrote about the operation and upkeep of alternators. No matter how good your boat’s alternator is, however, improperly sized batteries or inadequate charging can reduce the life of your batteries and the dependability of your boat’s electrical system. Make sure your boat’s batteries are properly secured, and that the battery cables are of a sufficiently heavy gauge to handle boat’s electrical demands. The marine world is full of battery manufacturers and types of batteries. The four main types of marine batteries are the flooded battery (which can be further divided into “wet” and “sealed” types), the gel cell battery, the absorbent glass mat (AGM) battery, and the lithium-ion battery. Each of these batteries is available in a number of different sizes, and each type has its own characteristics. How a battery works is quite simple. The typical 12-volt, deep cycle wet acid battery has six cells in it and each cell holds 2 volts of electrical storage. Let’s look at a single cell battery: the battery is in a plastic case that holds lead plates, which are suspended in the case. The case is filled with a weak solution of sulfuric acid. This is called the electrolyte. The two lead plates are connected to the positive and negative terminals on the outside of the case. When an electrical load is applied to the battery, the sulfur molecules in the electrolyte attach themselves to the lead plates, releasing electrons. These electrons move through the negative terminal to the load and back through the positive terminal. This process continues until all of the sulfur molecules are depleted from the electrolyte. At that point, the battery is either discharged or dead. To recharge a battery, the process is reversed and the electrons are forced back into the battery. The electrons combine with the sulfur compounds on the plates and are forced back into the electrolyte. Using a device called a hydrometer, you can measure the charge or specific gravity of the battery electrolyte. A fully charged cell would have a specific gravity of 1.265 and a voltage of 2.1 volts. At 50% discharge, the specific gravity would drop to 1.190 with a voltage of 2.030. A fully discharged cell would have a specific gravity of 1.130 and a voltage of 1.750. A battery’s life is determined by how many cycles of charging and discharging it can take. One cycle is a complete discharge and a complete recharge. The number of cycles you can expect from a battery depends on a number of factors. The depth of discharge will affect a battery’s life. If you constantly drain the battery to more than 50% of its charge, you will shorten the battery’s life. Leaving the battery discharged will also shorten its life. The rule of thumb is: only discharge your battery bank to 25% to 35% of the bank’s capacity, with maximum of 50% discharge. You can expect to get 50 to 75 cycles from a typical car starting battery, 350 to 400 cycles from a deep cycle marine battery, and 500 to 600 cycles from a gel-cell or AGM battery. Determining a battery’s rating (its capacity) can be confusing. There are four ratings that you must be aware of. The four ratings are CCA (cold cranking amps), MCA (marine cranking amps), and reserve capacity and amp hours. A battery’s capacity is reduced when temperatures drop. For starting batteries, the important numbers are CCA and MCA. CCA is the maximum discharge current in amps that a new fully charged battery can deliver for 30 seconds at 0 degrees Fahrenheit. MCA was developed by battery manufacturers for the marine industry. MCA uses 32 degrees instead of 0 degrees to measure cranking amps. The reason is that most boaters won’t be starting their boats at 0 degrees. The higher the CCA, or MCA, the easier it will be for the battery to start your engine. Reserve capacity is the number of minutes a battery can produce 25 amps at 80 degrees until the battery reaches 10.2 volts. The battery’s reserve capacity is the time it can supply power to the electrical system. Amp hour rating is the battery’s electrical storage capacity. This is obtained by multiplying the current in amps by the time in hours of discharge at 80 degrees. The rate that is used is 20 hours, so a battery delivering 10 amps for 20 hours=10 amps x 20 hours = 200 ah battery. 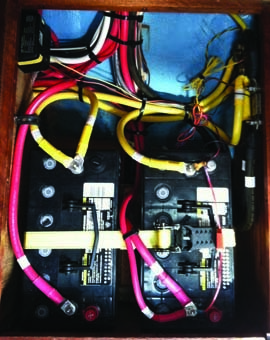 Flooded batteries: The deep cycle wet acid battery is the most common type on boats today. They are less expensive than their counterparts, but require more maintenance. They are constructed with much thicker plates than starting batteries in order to handle deeper discharge and more cycles. Their electrolyte is liquid sulfuric acid, and they require electrolyte levels to remain above the cell’s plates. So, if you have this type of battery, be sure to check them monthly and add water (distilled water only!) if the electrolyte levels drop. Sealed lead acid batteries (also known as a maintenance-free batteries) are permanently sealed, and do not require the periodic addition of distilled water to maintain them. They work much like the deep cycle wet acid batteries. There is enough electrolyte in a sealed lead acid battery for the expected life of the battery. But if it is overcharged the electrolyte will boil away, causing the cells to dry out and the battery to fail. With these batteries, you need to use a smart charger or a three-stage charger so as to not overcharge them. Gel cell batteries: The gel cell battery is a sealed, leak-proof battery that requires no distilled water. The electrolyte is in a gel form. The primary benefit of gel cell batteries is that their absorption rate is much higher than deep cycle, wet acid batteries. For this reason, they can handle more rapid charging and deeper discharging. Gel cell batteries are more expensive than wet acid batteries, and they require a charging system that does not go above 14.1 volts. Gel cell batteries can take a higher current amperage for charging, although they are sensitive to higher voltage charging. AGM batteries: AGM batteries are also sealed, and require no maintenance. Their positive and negative plates are separated by porous fiberglass mat that holds the electrolyte like a sponge. AGM batteries have a low resistance level, so they can accept a higher current charge and therefore be charged up twice as fast as wet acid batteries. AGM batteries are not sensitive to voltage levels like gel cell batteries, so they can be charged with conventional chargers and alternators. AGM batteries have a long service life and are virtually spill-proof, but they are much more expensive than wet acid batteries. Lithium-ion batteries: The newest marine battery on the market, the lithium-ion type, uses lithium instead of lead for its electrode material. Lithium-ion batteries (as used in electric cars such as the Tesla) have several advantages. As you’d expect, lithium-in batteries weigh much less than lead acid batteries – some are so light that they’ll actually float! – and they are becoming very popular on high performance racing boats for that reason. Because lithium-ion batteries can handle very powerful electrical current, they can be fully recharged in a third of the time required to charge a lead acid battery. They can also withstand three times as many charging cycles, which gives them a very long service life. Lithium-ion batteries have a slightly higher voltage output than lead acid batteries, and will deliver their full voltage until they’re completely discharged. Of course, this technological superiority has a very high cost…which won’t surprise anyone who’s visited a Tesla showroom. There are many different sizes and power options in batteries (up to 8d, with a whopping MCA of 1750, a reserve capacity of 450 minutes, and an amp hour rating of 225.) The smallest marine battery is the 24 series, or starting battery, so called because it is the same size as most automotive batteries. It measures 10.25 X 7.13 X 9.88 inches. Most of these batteries fall in the range of an MCA of about 525 and a reserve capacity of 80 minutes. The most common in mid-range boat sizes is the 27 series battery. This battery comes in three forms: the starting battery, the combination deep cycle/starting battery and the deep cycle battery. The 27 series battery measures 12.63 X 6.63 X 9.25 inches. The combination starting/deep cycle battery has an MCA rating of 730 and a reserve capacity of 160 minutes, with a 90-amp hour rating. An alternative to the 27 series battery is the 31 series battery. This battery is slightly taller than the 27 series battery but fits in the same footprint and offers an MCA of 1060 and a reserve capacity of 215 minutes, with a 130-amp hour rating. Remember that when you are increasing your house bank in amp hours, you need to increase the primary battery cable size to carry the additional amperage. This includes both the positive and negative primary cables. Always wear eye protection when working with batteries, never lean over the top of a battery, and take extra care using tools around batteries – a dropped wrench could short out the battery. Batteries can explode, so keep sparks and open flames away. Remember, there’s no such thing as a dead battery. A “dead” battery can still give off explosive hydrogen gas, so be careful!